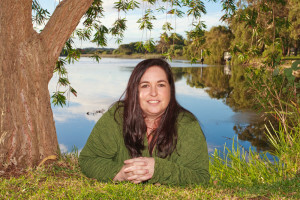 Multi-published Australian author, Nikki Logan, lives on the edge of a string of wetlands south of Perth, Western Australia with her partner and a menagerie of animals. She writes captivating, nature-based stories full of romance in descriptive natural environments. She believes the danger and richness of wild places perfectly mirror the passion and risk of falling in love. Nikki wrote for work for most of her life (copywriting, Public Relations, magazine publications) but it wasn’t until she came first runner-up in a ‘opening hook’ competition on national radio with a piece she whacked out in her lunch break that it occurred to her to write—really write—for a living. She entered the comp to win a pack of 50 books. She missed that by one spot but just two years later she ‘won’ something infinitely more exciting—a publishing opportunity with one of the biggest publishers in the world. She wrote her first full-length book in 2007 (a romantic intrigue set in the wilds of Zambia amidst the wildlife smuggling industry) when she needed a project to fill six months of accrued annual leave. Well and truly bitten by the writing-bug, she wrote a number of category-length novels after her return to work and hasn’t stopped since. She’s written twenty books for Harlequin Enterprises and now also writes romantic suspense for Entangled Publishing. Nikki has a Bachelor of Arts (Dbl Major – Theatre Arts; Film & Television) from Curtin University and has worked in the advertising, film distribution, theatre and wildlife conservation industries. She’s an accomplished vocalist and public speaker and she’s ecstatic to add ‘multi-published author’ to her list of achievements.